The command and support ship ABSALON arrives at Copenhagen on August 31, 2007 at 0605 in the morning. In this section you will find, amongst others, an almost complete listing of all ships serving the Royal Danish/Norwegian Navy from 1801-1814 and the Royal Danish Navy (RDN) from 1814 to the present day. The Fleet Lists gives you a complete survey of all known named ships in this period; however a number of unnamed ships and vessels, Canon Jollies, Cannon Shallops etc. are not incorporated into this first edition. Later on, I will try to incorporate specifications of all known ships during this period, including photos or drawings, details and history of every ship. The Fleet listings enables you to see a complete alphabetical listing of all ships at a given period. 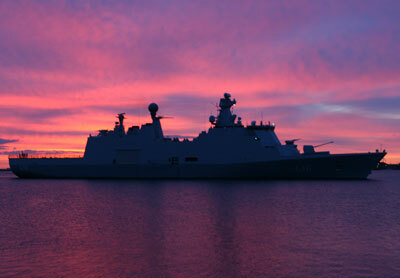 You will find a complete list of all ships serving the Royal Danish Navy from 1801 till the present day. You may also find specific list of ships for a given historical period. For your convenience, I have included a list of the present ships of the Royal Danish Navy (RDN), including pictures and specifications. This list will also be updated conti-nuously, as well as ships specifica-tions of these ships will be published on an irregular basis. The list is based on official RDN sources. This section will bring you more detailed information of the ships of the RDN, initially on the ships involved in the stories on this website. Hopefully, at a future day, you may find a complete listing of the ships of the RDN serving during the timeline from 1801 to the present day. You may also find more specifications on most of the foreign ships involved in the event unfolded on this website, either friends or foes. For an easy survey of the published Ships Specification you might use the Index. The complete database of the ships, will be constructed in such a manner that you can search it either by the type of ship or by the name of the ship. The construction of the database is unfolding. You may find more listings of naval ships, even from the time before 1801, by using "Orlogsbasen"
This website is a result of a joint project by the Danish Naval Museum, Danish Naval Library, The National Archives and "KulturnetDanmark". This site is constantly evolving and gives an Introduction to the Naval Dock Yard (Holmen), the Craftsmanship, the Architecture, the Art and much more. You may also find a database containing photos of the Danish Naval Museum's Ship's Models og the original Ship's drawings from the National Archives covering the period from 1690-1848. You will find around 250 photos of the Ships models from the Danish Naval Museum's collection and around 1500 line drawings out of a total number of app. 8000. On the Website of the Royal Danish Naval Museum you may also find a list of all naval ships launched in the period 1860-1990.